Quickie today : ) Not much time to shoot photos, and trying to decrease amount of time spent with mirror and camera fu fu. 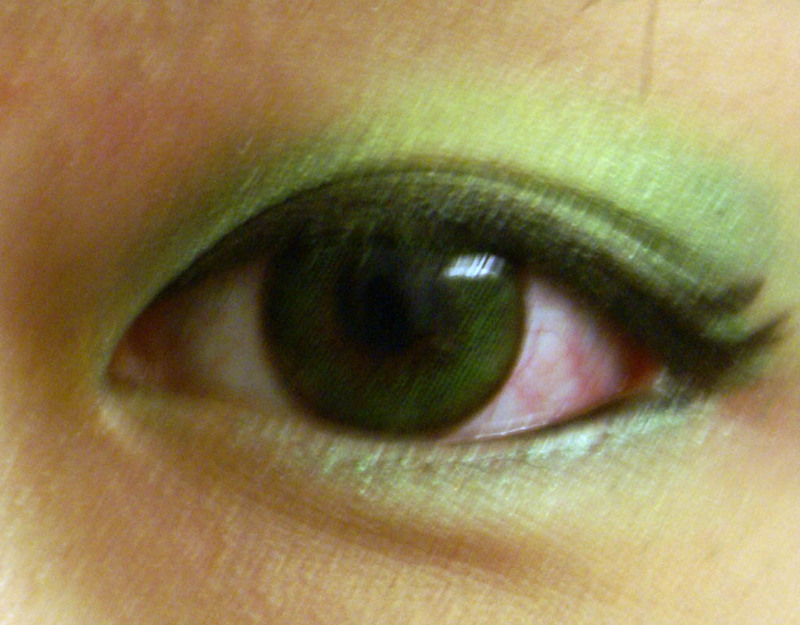 I wanted to do a green look to complement my contacts today but I got a little carried away with shadows and it turned out to be super acid vibrant green. I toned it down with darker greens for the meeting I had to go to but this would be cool for a shoot, especially for tomorrow's Eco Friendly Fashion Show (featuring clothes made out of newspaper!) The camera does no justice to just how acidic the colours were. I really do hate Extra Dali Size Green ... they rub against my eye all day, hence the intense bloodshotness and I also have to invert my right lens (basically put it on inside out) or else it hurts A LOT. Who's ever heard of wearing their contacts the wrong way to make it feel better? *shrug* Don't buy these lenses : / They're no fun! Oooh good to know about the lens ~ I was considering the dali in grey or blue. Speaking of lens, I can't wait for my nudy blues to arrive!!!! I ordered from kcirclelens, have you heard of? If you do a review on them, they send you another pair for free!